Unboxing the (2015) July BDJ Box: Prepped and Polished* | Vanity and Everything in Between. This month's box includes Dove Oxygen & Nourishment Shampoo and Conditioner that gives your hair 95% volume plus keeping your hair nourished. Now this is something I'm excited to try! I've always seen this in the grocery but I've been holding back in purchasing this because I'm still finishing my Human Nature shampoo and conditioner. Will use this pair next or try to alternate it my current hair care to experience that 95% volume they claim! Each bottle (180ml) is PhP115.00. There are 3 travel-size Cetaphil Gentle Cleansing Bars. I honestly would have prepared to receive a full-sized bar because the size is a bit too much even for a week's worth of travel abroad. We already know that Cetaphil is a good brand so I need not elaborate on this product. Another makeup product from FS Cosmetics is included in the box. I notice that FS Cosmetics is one of BDJ Box's staple item this year. This month's box includes their FS Luscious Lipstick in Primrose. This is a matte lipstick!! Review soon! Another Benefit product made a come back in this month's back - Benefit They're Real Mascara. I'm not a fan of this product because it smudges like whoa on me in a span on an hour after application. It does work on most people here in Manila. Then, we have Canmake nail polish which is an apple green shade. Methinks this is more appropriate for summer rather than the rainy season. But I can use this on my toes since I'm usually wearing closed shoes! I've already tried the Celeteque Cleansing Oil before and it was effective. Will use this once I'm finished with my H2O Makeup Remover. Two kinds of lip balm are in this box, too - Carmex Tube Lip Balm and Carmex Click Stick Lip Balm. I love lip balms. I have about 4 lip balms inside my bag. 2 on my bedside. I'm sure I'll be using the stick one soon! They're only PhP110 each! There's sachets of V 10 plus Serum. This is new to me! Has anyone tried this? You apply this after cleansing your face. Will try this next week! This month's box was okay. I didn't get too excited when I saw the contents because some were repeats. My favourite in this box is Dove and the lip balm although I still have enough back ups. Subscribe to BDJ Box and get one for only PhP580 per box! The box contains products worth way more than PhP580 which makes it always a great deal! So fast naman Ms. Gem!!! Received mine earlier but too lazy to post pa hehe :) See you tomorrow po! for the price this is pretty amazing.. looking forward sa review ng FS lippie.. omg!matte!! Parte rin pala ng buhay mo ang lipbalm, Ms. Gem! Me too! Even my three year old daughter has her own lipbalms. Two pieces muna for her, haha! Since my hair is so thick and fluffy, hindi na ako nagka interes na subukan yan Dove Oxygen Nourishment line. But I will be waiting for your review on the FS matte lipstick. It must have been good for it to be included in the box. I agree that the contents of the July BDJ Box are not that exciting, but nevertheless they are very useful. 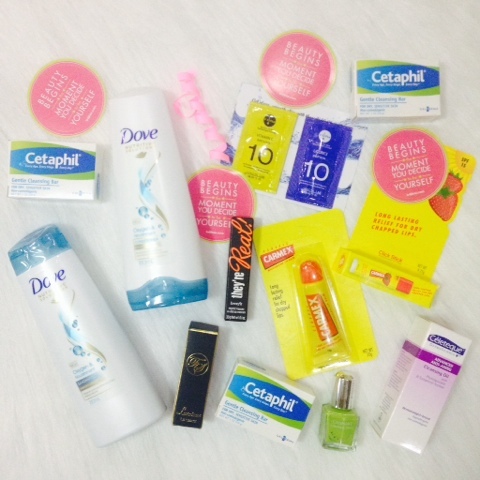 I like Dove shampoo, Cetaphil cleansing bar, and Carmex lip balm. Would be interesting to wear apple green nail polish! I'd love to hear your thoughts about the serum. I have an unused bottle of serum and I'm not quite sure if I should use it. I'm actually not impressed with the July Box. It's more of drugstore products kasi. :/ It would have been better if they have included more makeup products. I'm using Dove:) maganda sya sa buhok. Hehe. Sabagay pag may bago talaga, nakakaexcite gamitin:) Di nga masyado bongga ang box ngayon but still atleast it's sulit for 580. I just recently subscribed Miss Gem. Elite box na nga lang po yung available for October.